This liding funerary recipient is composed of three juxtaposed sheep heads. Out of each head emerges a foot, and the six interwoven horns define the form of the piece itself. Its powerful architecture comes from the extreme tension of the heads that seem to be thrusting outwards into space. In the late Neolithic period the ram, an animal seen as having a magic aura, was commonly sacrificed at funerals, its head buried as an offering alongside the deceased. During the Yin phase (17th century BCE) of the Shang dynasty, a fascination with volume and with realism emerged: quite unpredictably, a series of animal-shaped objects were added to the repertoire of round ceramic forms and to angular forms specific to bronze artifacts. 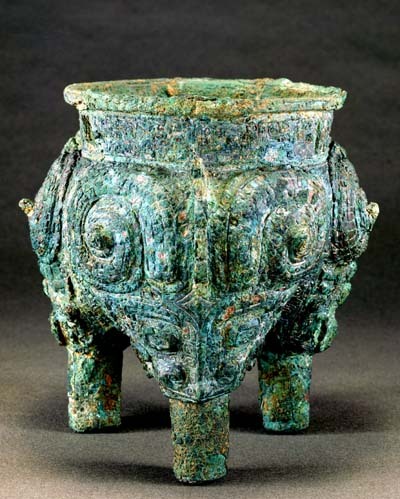 The tripod with breast-shaped feet is one of the most ancient Chinese recipients. The triple breasted form was functional and allowed food within to be more evenly heated. This piece was cast using a section mould and the decoration skillfully incorporates the residual ridges left between the compartments of the mould to create an enhanced rhythmical effect. Under the Shang, as the royal ancestor cult assumed a leading role in political and religious life, bronzes became veritable symbols of power. Ancestors were part of the divine order and would intercede in favor of the living if treated with due respect. Accordingly, these sacrificial instruments, the purpose of which was to mediate between the earthly world and the divine realm that legitimized royal power, were extremely important. Moreover, the extraction and transport of materials required in bronze production indicated a sophisticated state organization and highly centralized authority. These in turn implied, at this period, formidable capacities for conquest and maintenance of public order, as well as enormous economic efforts.